Every week Rochelle gives us an image to use as a prompt for writing a story in around 100 words. As she is sorting her book out at the moment, she is rerunning some old images. 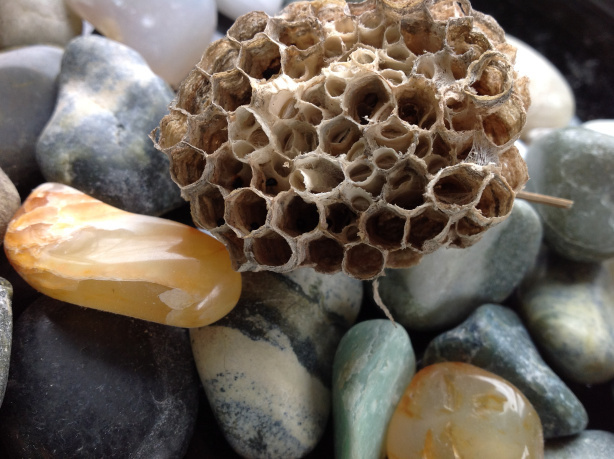 This image of a hornet’s nest is one I used for Raynard a couple of years ago. If you want to know who Raynard is, you can read the stories HERE. Raynard is a collaboration between myself and Jules Paige, and you can read her version of events HERE. This story does not involve him though. This is completely different. If you want to take part in Friday Fictioneers, then head over to Rochelle’s page (link earlier in this sentence) or if you want to read what others have written, then click on the blue froggy. He split apart and wasps with their fatal venom spilled from him and slew the Emperor’s enemies. This entry was posted in Photo Fiction and tagged August, August 2016, Creative Writing, Creativity, Fiction, Flash fiction, Friday Fictioneers, Online Writing, Short Stories, Short story. Bookmark the permalink. Beautiful epitaph and a true exemplifying of the nature of wasps! Oh, great scheme to break a siege or beat the enemies in their homes. It has a futuristic feeling with genetically manipulatd parasitic wasps… and the dialogue is great. Good use of the prompt. Nice one. Ah, clever trick — both him and your story. I love how much you can get across with just the dialogue (up to the last line), sometimes that’s all it takes. Nicely done! Eeeeeew! That was an ugly picture. But a good story. Wow, great scene, and good use of the prompt. Well written. Oh, very clever. Yes…so many jokes about the horse, but history sometimes is a good thing to repeat, especially when righting a wrong…well at least with would like to think that here. Oh yes. Back writing again. I have missed writing. Been able to get on with the book again as well. dances wildly.